I remember lots of sticker charts as a kid. At school, at church, at home. Whenever I did whatever was demanded by the chart, I got a sticker. 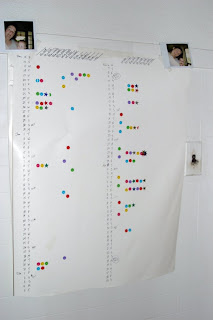 Almost 2 years ago, I was trying to think up new ways to motivate myself to exercise, and I thought 'Sticker Chart!' What a great way to keep track of what I've been doing, see my progress over the weeks, and have a public record for some accountability! Unfortunately, I got a little off track that first year. I was pregnant, and almost everything organizationally went out the window. 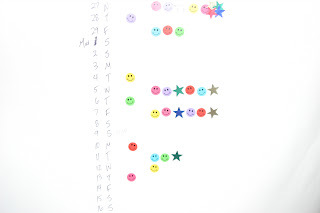 So, here we are today, and I've been successfully using my sticker chart for several months. Successful doesn't mean I exercise every day that I could, but it does certainly expose my habits for all to see. Some people have suggested this is just an excuse to buy stickers. I admit it. I like stickers. Actually, I like just about anything with adhesive, especially tape and post-it notes, but that's beside the point. The point that I'm wandering towards is that stickers can be great motivation, and not just for kids. I think I saw a half sticker on the big poster. What does a half sticker mean? Did you almost do something? Well I like seeing you keeping yourself motivated. a half sticker in that instance means I walked half of the time a sticker was worth. I don't really prefer to use half stickers, but I wea having a hard time then getting a full segment done.